First, a rant. I did’t like the knight for the main picture on the cover of this issue. Looking miserable astride his horse, the knight seemed stuck on the wall. It lacked the action that the Gobbolino picture exuded in Part 2 and the intrigue of the emperor in Part 1. That said, there was much to like in Part 3. 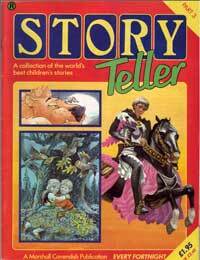 The Lion and the Mouse, one of the most famous of Aesop’s fables, was ably read by Dermot Crowley. The tale of heroic deeds from the small and the weak was as lighthearted as the Child of the Sun was dark and mysterious, the other Crowley-narrated story in this issue. Versatile actress Susannah York (who I had previously known only as Superman’s Kryptonian mum in the Christopher Reeve movies) read this issue’s classic fairy tale, Hansel and Gretel; the romantic poem, The Owl and the Pussycat; and the amusing modern tale of Simon’s Canal. She also provided the voice of the princess in the latest installment of Aldo in Arcadia (note: the character of the princess appeared again when Aldo in Arcadia returned for a second three-part series but was voiced by a different actress). Sheila Hancock was of course the reader for Gobbolino the Knight’s Cat. I remember complaining that this episode had only four pages (and not seven as the first episode) but Gobbolino’s adventures continue to thrill, just as Francis Phillips’ illustrations continued to enchant. In Australia these were called Story Time. I never got to finish my collection and the issues I have are so worn out that they’re falling apart. I’m DYING to buy the whole set again (just the first series would do me, plus a couple of X’mas issues). Somebody help me!! Where can I buy them – I’ve looked everywhere! !